That was the theme for the 4th annual Follow the Yellow Brick Road to the Wild in the Country at the Lions, Tigers & Bears sanctuary in Alpine. Nestled in the lowlands of the Cleveland National Forest, this no kill, no breeding facility is the heart and soul of Director and Founder Bobbi Brink. This annual fundraiser drew more than 450 people for a day with the exotic animals, dinner, silent and live auctions and much more for a sole purpose. To raise enough money to fund the sanctuary for three months and to bring four bears from across the country that need rescuing. Completely run by volunteers, including Brink, this event was a crowd pleaser for the many that donate time and money to keep this preserve alive and running. Brink said it takes $39,000 to run the facility for one month, and with new coming editions in the works, and a four-acre “wonderland” for Meatball the bear, Brink said she does this for the joy of saving these exotic animals from the exotic animal trade and death. “The exotic animal trade is a multi-billion dollar industry, is second only to the drug and weapons trade,” she said. Brink became involved with exotic animals in Texas in the 90s and found exactly what the trade was doing with the animals. With that in mind, and traveling back and forth from Texas to help save big cats, along with her husband, they bought the ranch in 2003 and began the process of creating the sanctuary. It began with several exotic animals and two tigers, Natasha and Raja. Now the sanctuary has grown and houses lions, tigers, bears, a leopard, mountain lion, small cats and an animal encounter with horses, llamas, goats and smaller animals. 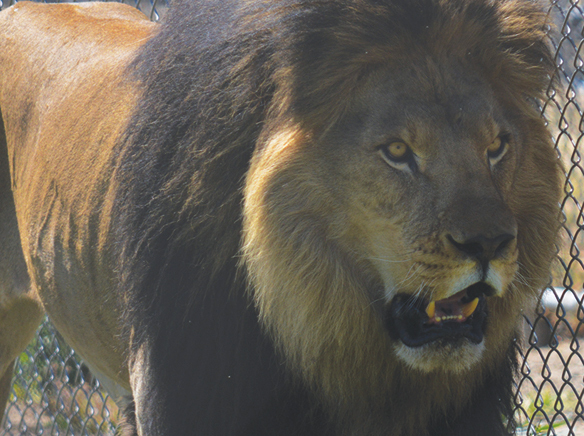 Lions, Tigers & Bears holds several fundraisers through the years, but mostly depends on the generosity of donors, who believe in Brink’s mission and love the animals that they call by name. The facility is not only open to the public, it entertains overnight guests and has a unique venue for any event. For more information on how to visit, donate, volunteer, obtain use of the facilities and to learn about the animals visit www.lionstigersandbears.org.